Does a grandparent have a legal right to have contact and visitation with grandchildren? The answer is that without a court order grandparents have no right to visitation but they may request visitation from the court. Georgia has a grandparent visitation statute which was passed to provide a way for a judge to grant a grandparent visitation rights with grandchildren. The grandparent visitation statute was passed to encourage continued interaction between grandparents and their grandchildren if they can show that it is in the best interest of the grandchild. So how does a grandparent file for visitation rights with the court? A grandparent can file a petition for visitation rights with the grandchild under the following circumstances. A grandparent may file for visitation rights when the parents are separated and the grandchild is not living with both parents. A grandparent may also file a petition for visitation when another relative has adopted the child and will not let the grandparent visit with the child. So what does a grandparent have to show in order to get visitation rights? First, the decision to grant visitation rights is for the most part in the discretion of the judge. Things the judge will consider and balance when making their decision will be parental rights, the best interest of the child and if denying visitation with the grandparent would harm the child in some way. With that said, it is up to the grandparent’s to show that it would be in the best interest of the child to visit with them. Some things the court will look at closely is whether the child ever resided with the grandparents, whether the grandparents have provided financial support and is there history of visitation between the child and the grandparent. Most importantly the Court will ask if denying visitation would harm the child in some way. The court will also make sure that if it orders visitation that visitation will not interfere with school or extracurricular activities. Of course there are many other factors the court will look at and the above is just a overview of grandparent visitation in a typical case. If you are grandparent and are being denied visitation with your grandchild you may wish to discuss with an attorney your options. Of course , before you file a petition in court try to work out your differences with the parent without going to court. However if all else fails then you may want to seriously consider forcing the parents hand with a petition for grandparent visitation. We have had an office in Ringgold since 2008. Now we have opened a second office in Chickamauga Georgia to better serve our Walker County clients. The office was until recently occupied by attorney Steven Ellis who was recently appointed to be the full time Walker County Juvenile Court Judge. 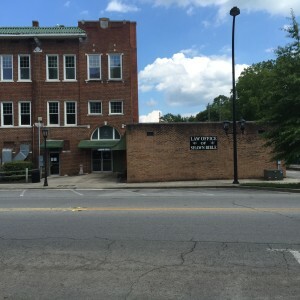 Its is located in downtown Chickamauga across from the Gordon Lee Mansion. It should go without saying that one should be careful what you post on social media. For example, if you are in the middle of a divorce it is not a good idea to post pictures of your new boyfriend/girlfriend. Or if you are a young person facing an underage drinking charge it is a bad idea to share with the world on Facebook how drunk you got last Friday. Anything that you post, tweet or otherwise make public on social media can and likely will be used against you in court. It is fairly typical for divorce attorneys to look at the opposing sides Facebook page. Anything you make public is fair game for an opposing attorney in a divorce or custody dispute. The same is true in criminal cases. I have seen people on probation violated because of what they posted on social media. For example, if you are on felony probation you are prohibited from abusing alcohol and drugs so don’t post pictures of you and your buddies at a bar. Furthermore, if the public can see it then so can the prosecutor handling your case. Do not post anything you don’t want the prosecutor, police, and your probation officer to see. The above seems like common sense that everyone would know already. However, in every court across the United States people routinely get in trouble due to social media posting. Don’t be one of those people. I was a guest this past Friday on Senior Talk with Virginia Scott on local station UCTV. We talked about issues related to senior citizens such as Wills, Powers of Attorney and Living Wills. My practice does not include estate planning but I was happy to speak on the subject.